Provices USB 1.1 / 2.0 / 3.0 passive connection via 6 in / 15 cm cable with gold plated contacts. Supports up to USB 3.1 Gen 1 speeds up to 5Gbps. As a USB 3.0 cable, our USB Type-C to female Type-A cable supports up to 5 Gbps SuperSpeed transfers for USB 3.0 devices, with backwards compatibility for USB 1.1 and 2.0 devices. 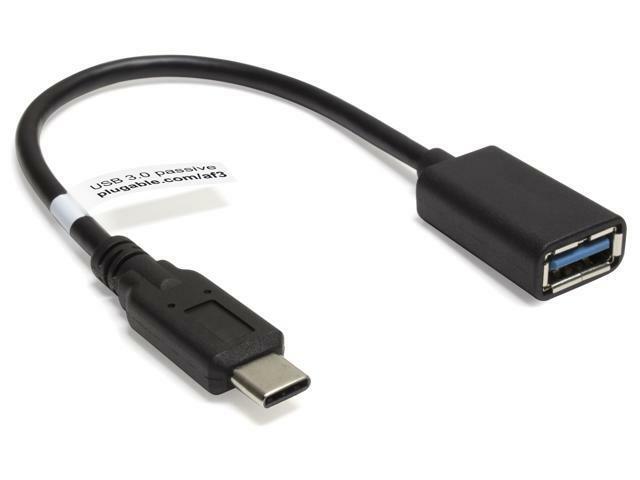 USB 3.0 adapters with USB Type-C connectors like this one are also known as USB 3.1 Generation 1. In terms of functionality, it offers the same throughput as USB 3.0 with transfer speeds up to 5 Gbps, and does not support power delivery. Compatible with any computer equipped with USB Type-C (USB-C) or Thunderbolt 3 ports, including the late 2016 MacBook Pro, 2015/2016 12" MacBook Retina, Google Pixel (2015), and many more. Note 2: Not a power delivery cable. Please note that smart phones and tablets may not deliver power through this cable. Through our USB Type-C (USB-C) to female Type-A cable, you can plug almost any legacy USB 1.1, 2.0, or 3.0 device you own into your new USB-C equipped laptop, tablet, or phone. Since this cable is a passive adapter and is short in length, its functionality prevents signal interference and timing issues associated with active cables. Our adapter cable features clean shielding and is easy to use. As a USB 3.0 cable, our USB Type-C to female Type-A cable supports up to 5 Gbps, SuperSpeed for USB 3.0 devices, with backwards compatibility for USB 1.1 and 2.0 devices. USB 3.0 adapters with USB Type-C connectors like this one are also known as USB 3.1 Generation 1. In terms of functionality, it works the same way as USB 3.0 with transfer speeds up to 5 Gbps, and does not include any charging. The new standard, USB 3.1 Generation 2, supports up to 10 Gbps transfer rates and provides power delivery as well as video and audio output. Enables you to connect USB 1.1, 2.0, and 3.0 devices to your new USB-C laptop, tablet, or phone. Includes USB Type-A Female and a Type-C Male connectors at each end. Provides USB 3.0 passive connection via 150 mm / 6" cable with gold plated contacts. Allows for transfer speeds up to 5 Gbps. Does not support BC 1.2 charging or power delivery. Tablets and phones must support the USB device being connected in order to work with this cable.